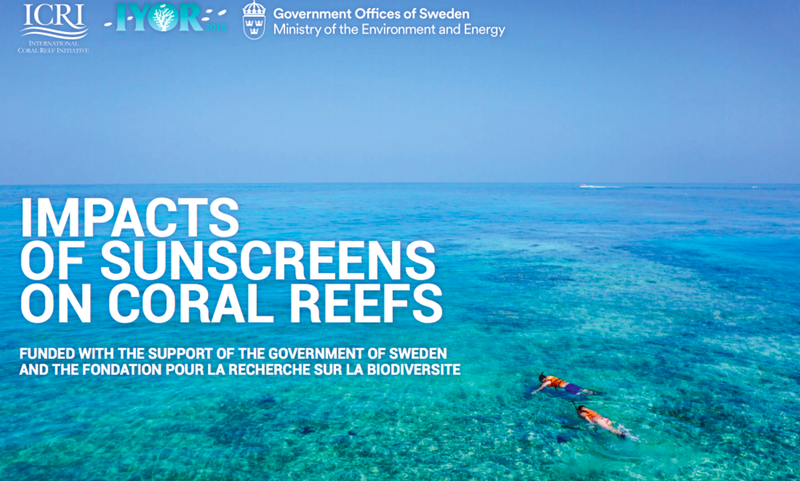 This document responds to Goal 3(5) of the International Coral Reef Initiative (ICRI) Plan of Action 2016-2018, which seeks to review issues relating to the impact of sunscreens on coral reefs. Sunscreens contain organic (chemical) and/or inorganic (mineral) UV filters that absorb, reflect or scatter UV light. They also contain inactive ingredients such as antimicrobial preservatives, moisturisers and anti-oxidants. Sunscreen ingredients including chemical (benzophenone-3 and -4 (BP-3 or oxybenzone; BP-4), ethylhexyl methoxy cinnamate (EHMC), homosalate (HMS), 4-methylbenzylidene camphor (4-MBC), diethylamino hydroxybenzoyl hexyl benzoate (DHHB)) and mineral (titanium dioxide and zinc oxide) UV filters have been detected in coastal waters. UV filters reach coastal waters either directly as a consequence of washing off swimmers and/or indirectly from wastewater treatment plant effluents. Many of these components have also been found in marine biota including fish, molluscs and corals as well as in sediments. Hawaii has become the first US state to ban sunscreens deemed harmful to coral reefs. Some years ago I completed my scuba certification at one of the world’s most spectacular coral reefs, Australia’s Great Barrier Reef. At that time, the reef was stunningly pristine, hosting an amazing variety of marine life. I was overwhelmed by the beautiful shapes and colors of the fish and coral and pledged then to continue diving throughout my life and to do what I can to preserve these beautiful places for generations to come. Needless to say, the devastation caused by coral bleaching in that area (I was certified near Port Douglass) breaks my heart. So, what can we do? First, what is it? Coral bleaching occurs when coral expelsthe algae(zooxanthellae) that live in its tissue,depriving it of its major food source. If prolonged, this will eventually kill the coral. Second, what’s causing it? 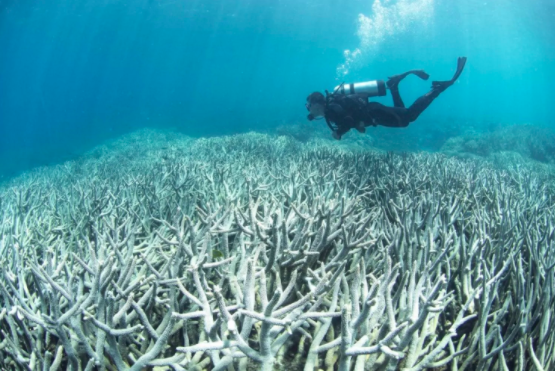 There are many causes of coral bleaching including local factors like over fishing, excessive tourism, careless diving, pollution and storms and global factors like climate change and acidification. Scientists agree that the biggest single contributor, and perhaps the most difficult to control, is rising water temperatures caused by climate change. 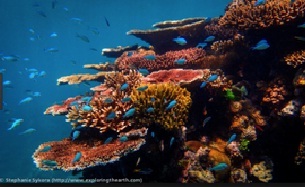 Third, how important are reefs? Although I’m very clear on the value of coral reefs to me and other recreational divers, I was somewhat surprised to learn just how critical they are scientifically, socially and economically. Although they cover less than 1% of the earth’s surface, reefs are home to 25% of all knownmarine species and surpass even rainforests in their diversity1. Over 850 million people live within 100km of reefs2 and depend in large part on them for their sustenance. 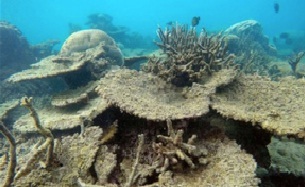 And, a recent attempt by the BBCto put a monetary value on the natural world's flora and fauna estimated that coral reefs are worth $9.9 trillion to the global economy3, or more than half the GDP of the United States. That number included the value of the fishing and tourism economies that coral reef support, as well as its ability to sequester carbon and mitigate storm damage. So, what can we do to attempt to save our coral reefs? There are several points of action. First, we should do all that we can to minimize human impact on coral reefs. Second, we should do what we can to improve the resiliency of coral reefs…to enable them to better resist disturbances and to fully recover from them, since we know disturbances will happen. Third, we should pursue research and known techniques to restore damaged reefs. Ways to minimize human impact on coral reefs on a large scale involves management, coordination and education. Marine Protected Areas (MPAs) (and networks of MPAs)that restrict human activity have proven very effective, particularly with respect to over fishing which can result in excessive fleshy algae growth. Individually, we must all do our share to (i) walk/bike/bus/electric car whenever possible; (ii) avoid red meat (as emissions from livestock is estimated at 15% of all emissions4,…); (iii) avoid the purchase of coral jewelry to eliminate consumer markets that encourage coral destruction; (iv) minimize the use of fertilizers/pesticides; (v) minimize the purchase and use of all plastic products; (vi) keep garbage out of our oceans; (vii) purchase sustainably farmed or fished seafood (see http://www.seafoodwatch.org/); and (viii) use appropriate sunscreen (see http://www2.padi.com/blog/2013/06/27/coral-reef-safe-sunscreen-for-scuba-diving/).